It should be Team Scotland for London2012. Or should it be Team GB again? In the wake of the Beijing Olympics, Gordon Brown returns to the old story of a UK football team for London 2012. But the issue is complex. The story runs simultaneously with the wider story of whether team GB should be dismantled, so that the home nations can perform in their own identities, as happens in the Commonwealth Games. The Scottish Government has repeated its calls for Scotland to have its own, separate team at the Olympics. Ministers said it would be good for Scottish sport. The SNP wants to hold an independence referendum in 2010 – two years before the Games in London. The case for a GB football team at the London Olympics is believed to put at risk the benefits of the national teams competing individually in other competitions, and particularly the World and European Cups. For Scotland, Wales, and Northern Ireland, these internationals are pragmatically the sole rationale for their survival. Gordon Brown sees the benefits to the 2012 games of an Olympics team GB, and of a football team GB as well. Rather audaciously, he would like to see Sir Alex Ferguson in charge of said team. Alex Salmond sees it differently. Mr Brown must be “seriously out of touch with Scotland”. “The whole concept’s ridiculous and only could be put forward by somebody who’s seriously out of touch with Scotland,” he said. There has been no British Olympic team since 1960, partly because of fears it could jeopardize individual sides. The Prime Minister, who has suggested that Manchester United boss Sir Alex Ferguson could manage the side, has been speaking with World Football’s governing body, Fifa, to reach an agreement on establishing British football teams. He said he would be surprised if there was not a team from the country which invented football competing on home turf in 2012. Mr Salmond is remarkable shrewd in judging a popular cause. Maybe he continues to strengthen his political aspirations over this issue. It is hard to assess the implications of his proposals. The rights of the four home countries to autonomy in world football is subject to the political machinations within Fifa, and the European football authority UEFA. Fifa president Sepp Blatter says a Great Britain football team at the 2012 Olympic Games should feature only English players. My own views are those of someone of Welsh origins long domiciled in England. As in Scotland, the media in Wales have been keeping a proud count of the athletes of Welsh origin in team GB. On balance, I rather like the idea of a supporting an Olympics Team GB. Despite reservations about obsessing over gold medal counts I was swept up into the counting game. I don’t feel that in 2012 I would have as much enjoyment keeping track of the overall Welsh medal tally. That is a relatively trivial point but the feel-good factor this time around does seem a lot to do with the metrics showing Team GB had done better than might have been expected, and as an added bonus for some, outperformed that yardstick of sporting envy, The Australians. But suppose Mr Salmond has to position his party as rejecting involvement in building on the achievements of Team GB in 2012, seeking an independent Team Scotland, foiling efforts at competing for football medals? If so, Mr Salmond for once may be backing an idea that is likely to be unappealing to a proportion of his target electorate. Not too damaging of itself perhaps, but it may offer political opponents opportunities to cast doubt on Mr Salmond’s growing reputation as an agile and sure-footed leader. In general, I found commentaries in the English press which largely supported the view that Alex has perhaps been less sure-footed than usual. A similar view could be found in Scotland on Sunday in which Kenny Farquharson described the First Minister’s position as churlish and petty. On the other hand, the respondents to Farquharson were overwhelmingly on the side of Alex (Salmond not Ferguson). So who is to say whether Salmond has once again been able to deep-dive into regions where other politicians do not go? ‘I’m just a simple sailor’. The quote by Admiral Lord West on Wednesday November 14th 2007 will become part of contemporary British folk-lore. The news story cropped up during a period of parliamentary struggles. Gordon Brown, having flourished in the first few months as Prime Minister, had found his Government falling behind in the opinion polls in renewed onslaughts from David Cameron’s conservatives. The political battles increased in intensity after the summer break (almost as time-honoured as the military practice of a pause to get the harvest in). In the United Kingdom, Her majesty’s loyal government writes the speech which the monarch then reads to her representatives gathered at the Palace of Westminster. The speech is then ritually debated by said representatives. One of the multiplicity of issues under scrutiny is a bid by the Government to increase the time in which suspects may be held in custody without charging. The debate involves deeply held concerns about liberty and the principle of habeas corpus. Habeas corpus (ad subjiciendum) is Latin for “you may have the body” (subject to examination). It is a writ which requires a person detained by the authorities be brought before a court of law so that the legality of the detention may be examined … Sir William Blackstone, who wrote his famous Commentaries on the Laws of England in the 18th Century, recorded the first use of habeas corpus in 1305. But other writs with the same effect were used in the 12th Century, so it appears to have preceded Magna Carta in 1215 … Michael Zander QC, Emeritus Professor of Law at the London School of Economics, says: “Habeas corpus has a mythical status in the country’s psyche. The specific circumstances which embroiled Lord West were those accompanying the security measures following the terrorist attacks in London in 2005. The Government under Tony Blair had failed to obtain further legal powers for the police to hold suspects without charge. Gordon Brown, on his appointment in the summer of 2007 attempts to revive and revise the proposals. As part of his idea of a Government of all the talents, Brown appoints Admiral West to a ministerial position, in August, as Parliamentary Under-Secretary (Security and Counter-terrorism), Home Office. The newly ennobled Lord West has been set a task to review security in public places. This includes the appointments of non-nationals to the Health Service. This brief was a swift response to one of the first challenges faced by the new Prime Minister. A foiled terrorist attack at Glasgow airport revealed involvement from a terrorist cell including medical specialists who had gained entry to the NHS with inadequate security screening. This week the debate on the Queen’s speech drew to a close. Lord West was preparing his report, meeting with various committees, and fitting in a round of press interviews. Gordon Brown was facing a testing Prime Minister’s question time, which would include tricky attacks on his intended security legislation. Lord West told the BBC at 0820 he had yet to be convinced of the need to extend the 28 day limit, a view at odds to most recent ministerial comments. Just over an hour later, after a visit to Downing Street, he told the BBC that he was actually convinced of the case. He later insisted he had not changed his mind, saying as a “simple sailor” he had not chosen his words well. The blogging community seizes on the story with enthusiasm. Why the hell have we got a ‘simple sailor‘ in charge of our anti-terrorism strategy? Were all the complicated ones busy? This is a rather nice example of the dynamics of a modern political story. At face-value, the reader is left with the impression of bungling incompetence from people who should know better. Stereotypes are reinforced. Brown is a control freak who manipulates others into shows of puppet-like obedience. Lord West is expected to toe the party line at all times, like the other puppets. Students of leadership are aware that beliefs tend to be grounded in ‘common-sense’ assumptions which can simplify the picture to an extent that we ignore aspects that are uncomfortable, or that do not fit in. It tends to be worth looking beyond the story for those inconvenient facts. Bloggers are strong at unearthing facts others would prefer to leave buried. However, righteous indignation is often more of an influence than efforts to examine and critique a story. For righteous indigation and balance, you have to go back to respected sources. Even that’s a matter of judgement. The Guardian’s view is not everyone’s idea of a balanced analysis, but it did seem to reach another level of insight here. 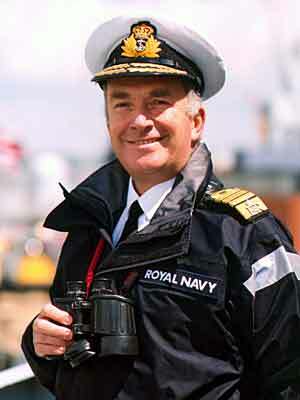 During his naval and governmental career, security minister Lord West has repeatedly spoken out against government policy. Before he stood down as head of the navy last year, Lord West, who distinguished himself in the Falklands war when he was the last to leave the sinking HMS Ardent, warned that cuts to the service would leave it unable to protect Britain’s coastline. The former first Sea Lord has condemned the decision by the Ministry of Defence to allow Royal Navy hostages held by Iran to sell their stories, has harboured serious doubts about the legality of the invasion of Iraq, and consulted lawyers over whether naval personnel could face war crimes charges. Despite, or possibly because of, his criticism of Tony Blair’s administration, West was appointed parliamentary under-secretary of state for security and counter-terrorism in Gordon Brown’s “government of all the talents”. His remit included conducting a review Britain’s terror laws, which has led him – once again – to put himself at odds with the official government line …. A case of herding cats? Question: How does leadership work in The House of Lords? Answer: The Conservative and labour Peers have a kind of ‘whip’ system [enforcement officers]. But managing cross-benchers … that’s like herding cats! The additional talents recruited into Gordon Brown’s Government are a new species, with evidence of some of the characteristics of the cross-bench feral felines. Where to begin? A cautionary tale, indeed for newly appointed Ministers, and maybe newly appointed Prime Ministers. But are there lessons for a wider range of students of leadership? Might the case be worth studying by any military officer considering a new career in the political arena for indications of necessary changes in comunications and decision-making styles? Or might there be lessons for any professional taking up a role a distance away from his or her previous career path? Above all, what actions and by whom might have resulted in a different and more desirable outcome? What can be learned from the ending of the Brown honeymoon? The Gordon Brown honeymoon is over. He has seen his party’s lead in the opinion polls whither away. His handling of the non-election has been branded cowardly and inept. His rival David Cameron scores overwhelmingly in parliamentary debate. What leadership lessons can be learned from the unfolding story? This is the current situation. Gordon Brown is widely reported as having lost the initiative he held since his appointment as Prime Minister. The fall from grace can be located in time easily. Prior to the labour party conference, the honeymoon period was continuing, and the main question was whether a snap election could destroy not just David Cameron, by maybe the Conservative party itself. During the Labour conference, Mr Brown’s speech at worse did not seem to damage his or his party’s prospects. Yet the snap-election story continued to build momentum. At the start of the month [October 2007] it seemed to have been settled. There would be an election within a month or so. Then the Conservative party conference, a well-received speech by David Cameron, and the news stories piled up full of bad news for Brown. The week following the election added to his woes in and out of Westminster. Over the last few months I have been frequently surprised by the ebb and flow of political events. So what were the surprises? What was the learning? Remember the passing of Tony Blair from office? I was surprised at the time by suggestions that portrayed Gordon Brown as a person psychologically unfit to lead his party, or the country. The contrast with business leaders is quite stark. The literature of the dark side of leadership is mounting, and it is easier to find examples of leaders who do not manifest symptoms of narcissism, with a dash of other fancily-termed psychotic tendencies, than to find examples of well-balanced (‘abnormally normal’?) individuals. Then I was surprised over aspects of the so-called Brown Bounce. That nice theory was made almost impossible to evaluate, because Gordon’s arrival coincided with a particularly turbulent time, during which the New Prime Minister acted in a competent and reassuring manner. [Remember the joke that had been told about him during his personal campaign to consolidate his election campaign? The trouble with Gordon, the ironic joke went, is that he is all substance. Ho, ho. ]. The honeymoon period is now over. One surprise is that no-one pointed to the curious contrast between the bounce, and the herd-mentality that had dubbed Brown a pathologically-flawed no-hoper for Labour, prior to election. The bounce transcended all those concerns expressed in the media? Over the last two weeks, I have also been surprised by the speed at which opinions about Brown and Cameron have swung back. The ratings are now [14.10.2007] roughly where they were before Mr Cameron hit policy problems a few months ago. Now, Cameron is as a hot a favourite for destroying Brown politically, as Brown was for destroying Cameron, a few weaks ago. I was further surprised at the damage politically the Gordon Brown has sustained over his assertion that his decision not to call an election had been nothing to do with opinion-polls in marginal seats. The statement has become taken as evidence that the Prime Minister is irretrievably untrustworthy. The second event, the afore-mentioned pre-Budget speech by Darling, is similarly taken as a sign of Government duplicity, specifically over Magpie politics. Specifically, like thieving Magpies, the Government has stolen the shiny baubles plucked from the Conservative lips, including inheritance tax from non-doms. The speech from Alistair Darling infuriated the conservatives, and particularly the shadow Chancellor, George Osborne. Alistair is in the Brown mould (measured and a bit, how can I put it, non-dom Scottish). Osborne is more of the smooth but menacing inclination, unafraid to take the fight to the muckier side of the farmyard. His immediate response to Darling’s pre-budget statement was a well-mounted piece of aggression at the calumny of his immediate opponent and the forces behind him, all the way up to King Gordon. The next morning he had simmered down enough to articulate the view that the public would now be able to choose between the party of principled and honourable statesmanlike politicians, (the conservatives) and the cynical duplicitous lot on the other side (labour). Overall he had had a good twenty-four hours, and is evidently on the way of becoming a dangerous opponent for the new Chancellor. Nice one George. Nice, in the sense of dangerously nasty. The various outbusts of anger left me conscious of the farmyard metaphor, that there’s a lot of mud out there, likely to spread itself liberally on to all concerned. Voters may find it confirms their suspicions if they are repeatedly told that there are a lot of cynical duplicitous politicians (CDPs) out there. On the other hand, drawing attention to this will not mean they will buy the proposition that all CDPs are to be found among the ranks of Gordon’s followers, thus enabling the conservatives convincingly to claim the high moral ground as The Principled Party. Some are immediately apparent. Gordon Brown contributed to the way in which this story developed. I rather think he moved back towards damage limitation in claiming responsibility for the election frenzy. (However tempting it might have been to bang on about the media). There was another misjudgment when he insisted that he would not have been influenced by opinion polls in his decision, even if they indicated a majority of hundred after an immediate election. The leadership principle is to retain some of that valuable commodity, wriggle room, whenever possible. Put another way, practice the art of the Delphic Oracle. Find a creative way of dealing with the question at two levels. Avoid yes or no answers when these are over-simplifications (which they almost always are). No-one will get it right every time, but the frequency of poor moves, and the damage sustained, is likely to be reduced. At least, that’s if you believe leaders are made not born, and are strengthened through learning from their mistakes. As the Conservative Party Conference drew to a close, uncertainty over the next general election was virtually over. Professional gambling firms placed November as odd-on favourite. Commentators also shifted from ‘likely’ to ‘probable’. In the conference hall it was clear that the party activists had reached a curious and heightened state of excitement. At the start of the Conference season, a few weeks ago, there was little talk of a general election. Interest was mainly on whether poor old Ming Campbell was going to survive, (he did), and whether an heir apparent could be identified (Nick Clegg and Chris Huhne). Then at the Labour party conference, the story was at first whether wooden Gordon would survive comparison with charismatic David. This notion was weakened as various opinion polls suggested that Gordon was increasingly rated as more capable in a crisis than David. At this point my own perception began to diverge from that of the emerging story, that that the new Prime Minister was preparing for a snap General Election. What had Gordon Brown said to have left this impression? Not for the first time, I found myself reminded of the phenomena impression management and sense making. A story was developing to help those involved deal with their deeper psychological needs. Taken out of context, Gordon Brown’s speech could be observed as a politician doing what politicians do, presenting himself and his party as favourably as possible. The reactions of the political observers and activists was quite different. Elsewhere I have written of how fear and suspicion can turn into conviction that something very bad is about to happen. The threat has become psychologically potent. Coverage of the election by Press and Electronic media become more frenzied. To such an extent, that not saying there was not going to be an election was taken as evidence there would be one (hope you get my drift). The news becomes “Gordon Brown hasn’t ruled an election out” Or, “He hasn’t made up his mind but is thinking had about it”. Then every statement and action of anyone offering a view is interpreted in these terms. The conference speech is demonstrated to be one designed to kick off an election campaign. For example, Gordon hardly mentioned the conservatives (or the other political parties). That’s blatant electioneering, pretending to be above such knockabout matters. He hardly mentioned Iraq. Later the conservatives quoted the puny number of words devoted to Iraq in the speech. So there, the point is scientifically buttressed. Then, more straws in the wind. The Prime Minister’s diary is being rejigged. That clears the way for a General Election. Even if he doesn’t decide to go to the country in November, all these actions are about outmanoeuvring the conservatives, those bastards to be ground into the dust, in the typically restrained and considered words of Lord Kinnock, at a fringe meeting this week. I just don’t get it. The views of political commentators have converged on the significance of a general election. Gordon Brown could have stopped such speculation if he had wanted to. Perhaps. If he could. If he had to. But not just because he could. Now, the media argue, if he decides not to hold an election, it will demonstrate he has bottled it. The sort of mood around at present seems to me to be that of ritualized posturing that conceals nervousness. I’m reminded of herd behaviour. The combined galloping herd of media and political hacks are galloping about, instinctively sticking close together in a state of panic, seemingly unaware that ‘it’s not the election, stupid’. If the Prime Minister now avoids an election he’s timid. Afraid he won’t win. If he does, it’s because he’s afraid that the economy will be in a worse state in a year or two. At least, that’s the analysis of former Chancellor Ken Clarke, remembering Clinton’s motto always that ‘it’s the economy, stupid’. In the disdainful words of Margaret Thatcher many years ago, he’s frit. Challenged that she might ‘cut and run’ she responded to questions by Michael Foot and some barracking by Dennis Healy. The right hon. Gentleman is afraid of an election, is he? Afraid? Frightened? Frit? Could not take it? Cannot stand it? If I were going to cut and run, I should have gone after the Falklands [when her political standing was at the highest it would ever be]. Listening carefully to insiders interviewing insiders, I arrived at a political insight. The view heard, and the herd view is a genuine belief that Gordon Brown’s actions are all part of carefully prepared plan to gain short-term electoral advantage to reinforce the decision to call an election. During the conference, we learn that Mr Brown is going to Iraq. More electioneering. On the brief visit he announces a troop reduction. Even more electioneering. Could his words be shown to be a form of stealth electioneering, this time taxing credulity? The anger expressed by two former Conservative leaders, John Major and Ian Duncan Smith in interviews was intense and utterly convincing. David Cameron made a speech that was billed as significant for the very future of the conservative party. I will reconstruct my notes for a further blog. The test was now whether David’s assured style could prevail against Gordon’s weighty woodenness. Suffice to say that the speech was reported as impressive in style. I take the BBC view, as that venerated agency still attempts to provide a balanced view of the political scene. It was also a performance that fired up the party faithful. He spoke without notes … warning the audience that it might be a bit “messy”. It wasn’t. It was a highly polished performance – and a lot more measured, serious and policy-heavy than we are used to from Mr Cameron. He once again tried to cast himself as the voice of optimism and sincerity – compared with the “cynical” Gordon Brown, who was trapped in the “old politics”. Mr Cameron ended with a challenge to Gordon Brown to call an election. Come on Gordon, make my day. But it was exactly what the party faithful wanted to hear. He told them to “get out and fight” for the changes they want to make and they cheered him to the rafters. Fear and threat had temporarily been abolished in the hall. You are currently browsing the archives for the Gordon Brown category.